Dive into this character flashback, then read 'Star Wars: Age Of Rebellion - Grand Moff Tarkin' #1 today! Cantina Comlink is your weekly smuggler’s run to spotlight Star Wars comics as only Marvel can make ‘em! 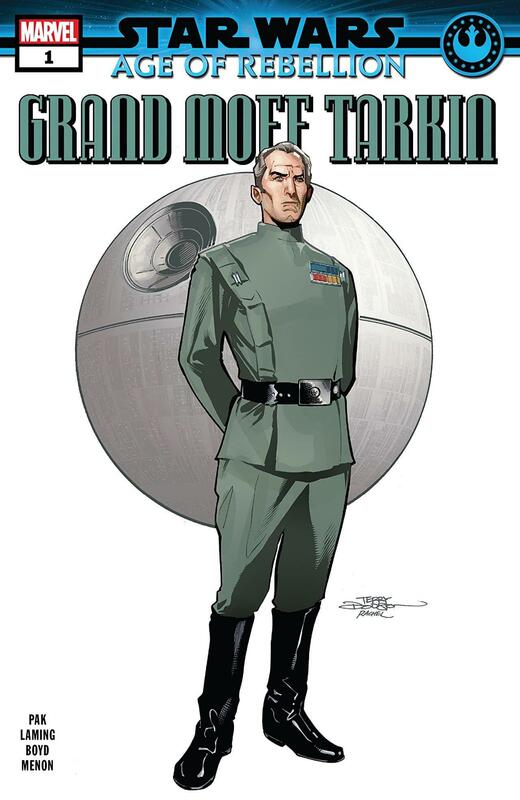 This week, STAR WARS: AGE OF REBELLION – GRAND MOFF TARKIN #1 proves the old saying “the evil men that do lives after them” as it continues to serve as evidence of our fascination with the Imperial leader long after his destruction with the Death Star. In this brand-new issue, learn the secret story of the Grand Moff, the horrors that honed his resolve, and the terrifying steps he takes to ensure that the Death Star lives up to its deadly name! 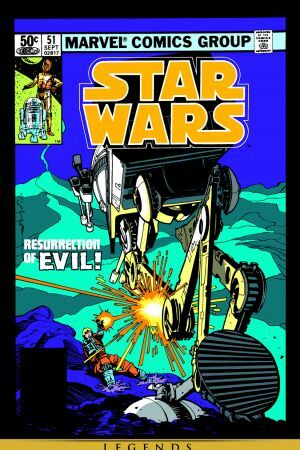 In 1981’s STAR WARS #51, the Rebel Alliance called Luke Skywalker and Leia Organa away from their ongoing mission seeking out a new base to impart devastating news: in the aftermath of the Battle of Yavin, the Empire quickly constructed a new planet-killer weapon and was poised to inaugurate it in terrifying fashion. Disguised as workers, Luke, Leia, Chewbacca, and the droids infiltrated the Imperial project and came face to face with The Tarkin, a “great cyclopean sentinel, its ionic eye ready to spit death in a blink.” The immense, space-borne weapon consisted of a huge laser dish, a clutch of engines and shield generators, and an “unsettling resemblance to the deservedly infamous Death Star.” Once on board the weapon, Leia was reminded of her home planet Alderaan’s destruction, while Luke was reminded of his mentor Obi-Wan Kenobi’s killing on its predecessor. The specter of Grand Moff Tarkin hung over the Rebels as they made their way deeper into the station, unaware of a certain Dark Lord taking notice of Luke’s presence through the Force… While Vader himself was unknowingly being targeted by a group of traitorous Imperial officers on The Tarkin who plotted his death! 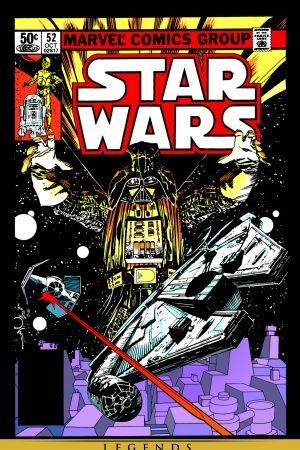 In STAR WARS #52, the “direct descendant of the Death Star” neared completion and the story began to play out much like the Rebels' infiltration of that artificial moon, but with one striking difference... Whereas Grand Moff Tarkin worked alongside Darth Vader as a seeming equal, the Tarkin’s officers watched and waited for their opportunity to end what they saw as the Dark Lord’s unfair “sorcerous ways” to winnow their ranks. That opportunity finally arrived when Luke walked into a trap set by Vader before both of them found themselves sucked out airlocks opened by one of the officers from the bridge! Skywalker’s artificial hand saved him from hard vacuum, while Vader called upon the Dark Side of the Force to walk step by step back into the station. After that, things grew more intense as the Rebels fled The Tarkin on a ship they’d seized, only to be attacked by Darth Vader in his specialized TIE fighter. The officers then saw yet another opportunity to destroy their enemies—Vader included—by activating the station’s ionic cannon. When they did so, The Tarkin exploded with dramatic fury and Leia explained to Luke that she’d previously switched the polarity on the weapon, effectively causing it to destroy itself. The Rebels flew away, one more Tarkin destroyed, yet knowing the man’s legacy of evil lived on. Discover the untold past of the character in this week's STAR WARS: AGE OF REBELLION – GRAND MOFF TARKIN #1 at your local comic shop now!